AMAZE YOUR FRIENDS, FAMILY AND COLLEAGUES WITH 220 INCH BIG SCREEN UNDER $100 ! Do you want to have a mobile theater? The traditional projector must be mounted in 1 location and runs off of wall socket electricity. 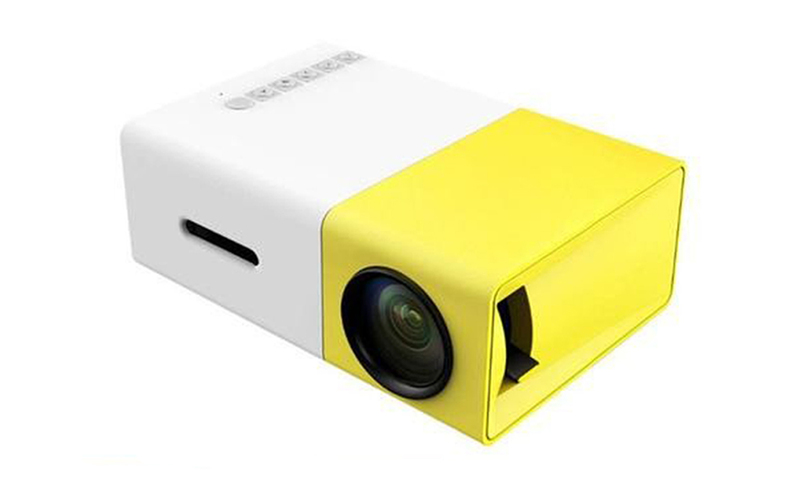 With the mini project you get all the benefits of a traditional projector, but in a small, portable, package. This is no exception, in meetings, camping, or anywhere on the go! The possibilities are endless. With a vast array of connectivity options, its portability, and its strong battery life ensure that no matter what you need, it is always there for you. Today technologies are spreading day by day by giving us more and more comfort and modern life. Here we are talking about YG-300 LCD projector it is the type of video projector by which we can do many thing like displaying videos, images or computer data on screen or other plane surface. It is modern equipment which has many features and functions. It helps in giving the presentation at large size screen at big companies. You can also set it at your home for watching movies and videos with your family and friend’s at large sized display or surface. It is the combination of red, green and blue components of video signals displayed on surface. We know that in market large sized LCD TV’s and Monitors are there but everybody cannot effort to buy big screen TV’s, some have presentation to show large number of people, some have to enjoy big screen movies at home with friends and family. You don’t have to worry LCD projectors are here you can enjoy large sized screen at cheaper rate. Here we have YG-300 LCD Projector. This device looks small but it has quiet large features. It is a multimedia player with high-performance projector and high-quality picture resolution 320×240. The resolution can reach up to 1920×1080. Its contrast ratio is 800:1, which is quite good. Images and videos come with high quality and clarity will be also good. Its brightness is 400 to 600 lumens also a good feature for better performance and quality. It supports AV/ CVBS/ HDMI/ USB multimedia interfaces. With this you can connect it to DVD player, Laptops, Computers, Set-top boxes, Gaming consoles etc. 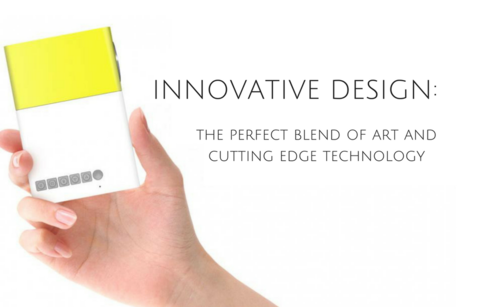 It has got high capacity lithium-ion battery of 1300mAh so you don’t have to worry about electricity it can work long enough without plugged in to electrical socket you can use it anywhere or anytime also when electricity is gone. 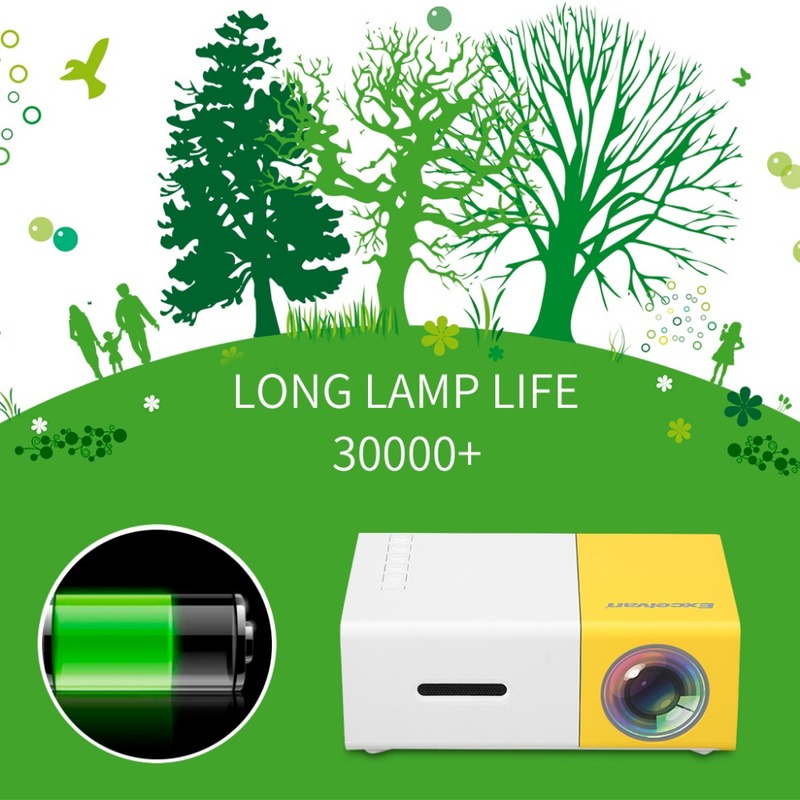 It has LED lamp with good quality you need not to replace it and lasts long about 30000 hours continuously. It has infrared remote control used to control device functions wherever you are. 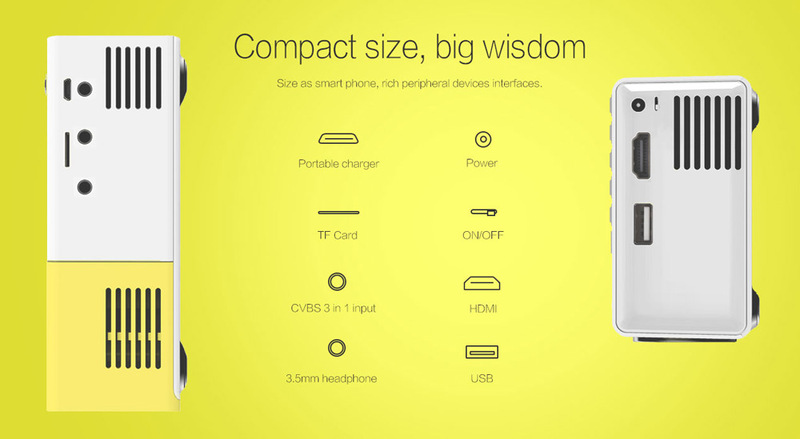 It has a card slot and also USB port by which you can put pen drive or memory card in it and watch on big screen and enjoy. Its input power supply is 5v and comes with the color Yellow. It has a light about 0.245 kg and overall package weight is about 0.450 kg. The product size is: length is 12.5cm, width is 8.5cm and height is 4.5cm. It has perfect design and smooth finish with combination of fashion and art. It has advanced cooling system so don’t worry about get heated it can manage all processes going inside the box because it is designed in such a way that it can’t create any problem or get worse. Its performance will remain same forever it is up to you how you manage it. It supports different languages, for example, English, Chinese etc. Finally a tiny, portable projector that turns your living room into a full-blown home theater with an image up to 220 inches! It's jaw-dropping 1080p HD resolution are perfect for movies, gaming and even business presentations! ...without the annoying problems like video jitters, color problems or lamp replacements that older projectors had. It is fast, reliable, good looking and has better performance with you. So don’t think too much if you want high quality and HD interface select this YG-300 LCD Projector because it is the best and easy to use comfortably. 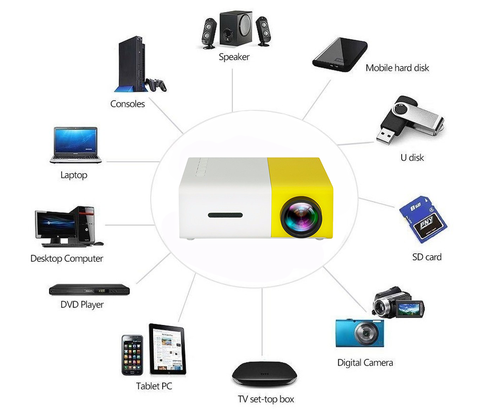 This product only $69.99 and free shipping anywhere it comes with 3 different sizes namely AU Plug, EU PLUG, and US PLUG color yellow and package contains: 1 YG-300 LCD Projector, 1 Remote controller, 1 AV cable, and 1 English Instruction Manual. NOTE: Today only we're giving you this projector for 40% off. So demand is crazy right now - please allow 1-2 weeks for shipping. 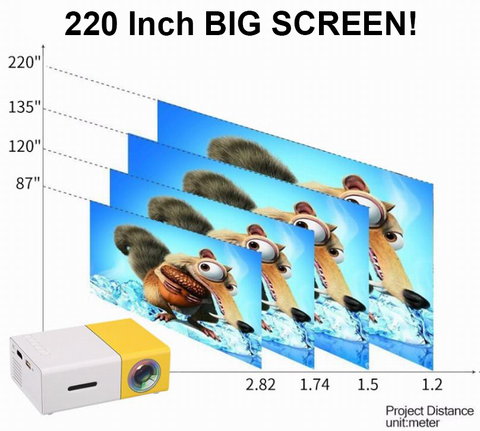 GET YOUR MINI PROJECTOR NOW! © 2017 icoolgadgets.com. All rights reserved.